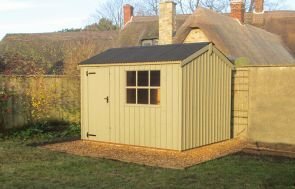 This particular design differs from other Garden Sheds in the National Trust Range, as it includes a 900mm wide logstore. This feature has multiple storage capabilities. The traditional style of the National Trust range can be seen in the black corrugated roofing material and cast iron features on the door. The corrugated material also helps make the roof waterproof. The vertically sawn cladding has been painted in National Trust Earls Grey. Our wide range of National Trust buildings are inspired by the striking outbuildings on the trusts estates across East Anglia. Throughout the collection we've ensured to keep to this theme, including suited features such as natural shades and corrugated roofing material. We have luxury Garden Buildings to suit a wide variety of purposes and styles. You can see the full bespoke range for yourself at one of our seven UK Show Centres. Our expert team will be on hand to answer any questions you might have. There's quite a story behind the creation of our National Trust buildings - to learn more about our design process and what National Trust buildings we offer please click the link below.